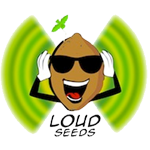 Loud Seeds evolved from a small group of Northern Carolina growers and breeders who\'ve been working with the finest Cannabis strains over the last 20 years. Nowadays, the organization is run James Loud and Mike Seeds. James Loud is a Northern California native and has been growing and breeding cannabis for the better part of 20 years, focusing on organic growing. Over that time he has acquired a vast collection of rare cannabis genetics. He has worked with some of the finest cultivators in Northern California and Washington State on innovative growing techniques and breeding projects. Currently Loud Seeds is focusing on stabilizing and crossing Top California genetics to get feminized and natural unfeminized indica, sativa, and hybrids strains. Original versions of OG Kush, Chemdawg, Sour Diesel, Jack Herer, Grand Daddy Purple and Girl Scout Cookies are just a few of the rare strain that Loud Seeds is currently focusing on.